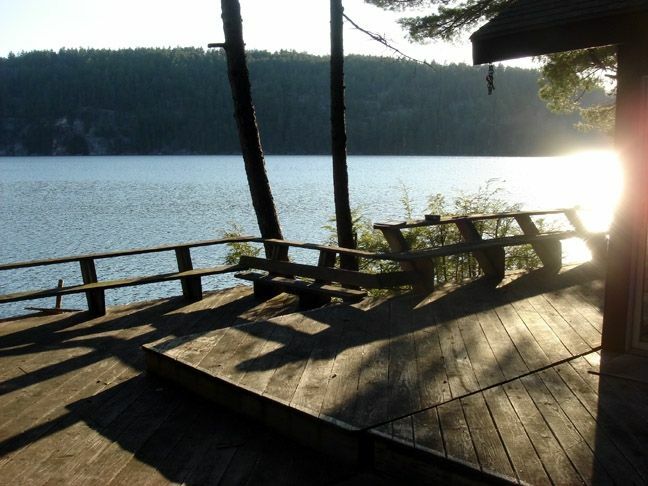 Our cabin is located on a beautiful private peninsula (1 1/2 Acres) with over 1000ft of lake frontage. It's perfectly located & close to everything: Acadia National Park & Bar Harbor: historic Castine; Blue Hill; etc. ; Yet tucked away from it all, too. Cozy Maine cottage with teardrop shaped fireplace makes for a perfect lakeside get-away on one of Maine's most desirable lakes. Craig's Pond is one of Maine's Top 10 Clearest Lakes with no equals in the area. Entire glass front of cabin offers unforgettable views from every space. Built before setbacks, the front deck goes right up to the crystal-clear water (most places have to be set back hundreds of feet from the water). Spectacular views of the lake from everywhere on the property. Complete privacy & seclusion with no visible neighbors allows for the solitude and serenity Maine is known for. Pet friendly. 100% 5-Star reviews! Everything you need for an unforgettable holiday in Vacationland. Guaranteed! P.S. - Looking over listings, I imagine it's hard to tell one lake from another. Water quality, water clarity, neighbor proximity & development are hard to tell by listings or photos. Craig's Pond is considered the best lake anywhere around, and it is the gem that all locals (and out-of-staters that know it) see as the hands-down pinnacle of Maine lakes. There are only a dozen or so total cabins on the lake and they are not overly crowded like at some lakes. This is Maine's Best Kept Secret and rarely are camps on Craig's Pond available for rent. Our calendar always fills up with return renters. Stay at our cabin and you'll see why. 100% 5-star reviews! The cottage sits right up against the water. Perfect place to getaway from it all. Jay's cabin was the perfect lakeside escape from it all. We spent our days at Acadia, came back to the cabin, enjoyed some wine on the deck and relaxed by the fire in the evenings. Wish we could've had better weather while we were there to enjoy the fire pit outside! The weather finally cleared up on the last day we were there to take out kayaks out on the lake. My first time in a kayak and it was so much fun! Very peaceful and relaxing cabin. Jay was quick to answer our texts and emails with any questions or concerns we had. We are return visitors to this delightful spot for a reason, or I should say for many reasons. Again, it did not disappoint, and if possible is more beautiful than we remembered. We all agree our skin is so soft after daily swims in the pond. Thank you, Jay, for continuing to allow others to enjoy your peninsula paradise. Neighbors are so nice too! Once again we had an awesome week at Jay's camp on Craig Pond - last year was June and the water a bit on the chilly side, this year was the last week of July and the water was perfect temperature for prolonged swimming, snorkeling or lounging on an inflatable. The camp location on the water could not be better. Loons, mergansers, kingfishers, ospreys, and hawks were common sights. We read on rainy days or played games. As soon as the sun came out we moved to the deck to recharge our batteries, then to a watercraft for exploring. This is amazingly clear freshwater for snorkeling so bring your equipment if you have it or buy some. At one point I was treated to being surrounded by hundreds of curious minnows and several interested sunfish as I dove to recover some lost fishing gear we happened upon during a perimeter paddle of the pond. This was reminiscent of snorkeling in the clear waters off the coast of Belize. Near the camp fat polliwogs at various states of development can be chased down for temporary collection and inspection by the kids. Some resident sunfish under the dock are always overly eager for tiny bread balls. For kids, dogs, and adults, this is a wonderful place to stay! Great little gem on one of the most beautiful lakes I have ever seen! Greatly enjoyed our stay and would recommend to anyone! Beautiful setting right on the lake! I loved sitting on the deck with a glass of wine and staring at the different moods of the lake. I also loved the fireplace - we enjoyed a fire almost every night. The cabin really represents all that is beautiful about Maine! The owner is a really nice guy and very accessible. The property itself is rustic, but has everything one may need for a comfortable stay. The location on the lake is lovely and with enough land for exploring. Jay is so accomadating and is a wonderful host! Just go you wont regret it. Situated perfectly between Acadia National Park (MDI/Bar Harbor), Bangor, Bucksport, and Ellsworth.